around 0030 Monday (0930GMT Sunday). Two Black Hawk helicopters set down at the compound after one develops problems. A team of 25 Seals breaches at least three walls to reach the main building. On the second floor US commandos find Osama Bin Laden with his wife. She is shot in the leg. Bin Laden, who is unarmed, is shot twice and killed. Computer hard drives and other evidence is taken from the compound, along with Bin Laden's body. The US team departs after destroying the damaged aircraft. President Barack Obama followed the raid on Bin Laden's compound from the White House situation room - a secure space used to monitor and manage crises. For 40 minutes, the president and his senior aides were kept updated of the progress of the operation. 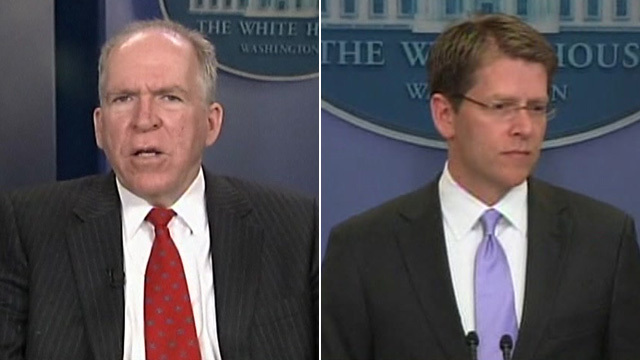 "The minutes passed like days," said White House counter-terrorism chief John Brennan. On hearing of Bin Laden's death, Mr Obama declared: "We got him." Footage from inside Bin Laden's Abbottabad compound tells of the bloody fire fight that left the al-Qaeda leader dead. One of the helicopters used in the operation failed and was destroyed by the special forces before they left. The fortified compound was built on the edge of the hill town of Abbottabad, with no phone or internet connections. The Pentagon released satellite images dating back several years of the compound where Osama Bin Laden was discovered. They clearly show how it was extended over the years. The US operation to kill or capture Osama Bin Laden was months in the planning but took just minutes to complete. In a daring raid 120 miles (192km) inside Pakistan, a team of US special forces flew from Afghanistan to Bin Laden's hiding place in the dead of night. They swooped down on the compound in stealth helicopters, swept through the buildings within the high walled enclosure and shot dead a total of five people including Bin Laden. Around 40 minutes later they left, taking with them Bin Laden's body and a hoard of computer data devices and other information containing intelligence about al-Qaeda and Bin Laden's activities. They left behind the other dead, among whom were a woman and one of Bin Laden's sons. They also left a group of three women and 13 children - two girls and 11 boys - bound with plastic ties. The US team was forced to abandon one of its helicopters after it was damaged in a hard landing at the compound site. It was mostly destroyed in an explosion set by the US forces as they departed. Publicly, the US authorities have given few details about the raid and some of these have changed since the news of Bin Laden's death was officially announced. What follows has been pieced together from official US statements and off-the-record interviews, other news sources and BBC interviews with those living near the compound in Abbottabad, the quiet, leafy garrison town 35 miles north of the Pakistani capital, Islamabad. Just a handful of US military and senior officials around President Obama knew of the planned raid. However, within seconds of the arrival of the US helicopters overhead in Abbottabad on Monday, their presence was being advertised on Twitter. "Helicopter hovering above Abbotttabad at 1am (is a rare event)," tweeted Sohaib Athar, an IT engineer who lives about 3km (two miles) from the compound. Eleven minutes later Athar reported: "A huge window-shaking bang here in Abbottabad. I hope it's not the start of something nasty." On the other side of the world President Obama and his closest advisers had gathered in the White House situation room to monitor progress of the assault. A few miles away, at CIA headquarters, the spy agency's director Leon Panetta sat in a windowless seventh floor room, which had been turned into a command centre. From there he fed the president and his team details of the raid as it unfolded. The operation now under way was the culmination of weeks of detailed surveillance and planning involving some of the United States' most sophisticated technology. Planning for the raid started late last year. US officials have spoken of how an intercept in late August 2010 of a phone call to a trusted courier of Bin Laden in Pakistan was a breakthrough that led to the raid. The call was made to Abu Ahmed al-Kuwaiti, a man the US had been seeking for years as part of the decade long hunt for Bin Laden. Controversially, they had learnt of his identity from interrogations of detainees in Guantanamo. Armed with the mobile phone number, the US was able to track him to the compound in Abbottabad. It was unusual. High walls prevented anyone from seeing in and privacy screens on the main building's balconies blocked all sight lines. It had no phone or internet connection and all rubbish was burnt inside the high walls rather than being collected as usual. Access to the site was through a tall green metal security gate which led into a passageway with high walls either side, and another security gate leading to an inner compound at the other end. According to neighbours who spoke to the BBC, the occupants rarely went out and when they did so - in either a red Suzuki jeep or van - they passed through security doors that closed immediately afterwards. US intelligence soon began an intensive period of surveillance. While satellites watched from the sky a CIA safe house was set up nearby. From the safe house, agents were able to observe the comings and goings from the compound in order to establish a "pattern of life" at the building. Some details of how they tried to obtain key information about the building have emerged. Locals told the BBC that in the weeks leading up to the raid, people in "simple, plain clothes" knocked on doors in the neighbourhood posing as prospective property buyers. They would admire the homes and ask for any architectural plans, saying that they wanted to build something similar. One of the men even went to Bin Laden's compound to make inquiries, they said. The CIA also employed a sophisticated stealth drone that could float high about the compound without detection by the Pakistani authorities. With its distinctive bat-winged shape, the RQ170 Sentinel is capable of flying undetected at high altitude taking photographs and sending real-time video. The aircraft can also capture images shot at an angle. This has the advantage of not having to fly directly over its target. Despite the presence on the ground and observation from the sky, the CIA was still unable to positively identify Bin Laden as the man often spotted often walking up and down outside the house. Agents dubbed him "the pacer". He and his associates went to extraordinary efforts to remain undetected. According to a detailed account of the lead-up to the raid in the Washington Post, US officials were "stunned to realise that whenever Kuwaiti or others left to make a call, they drove for 90 minutes before placing" a battery in a mobile phone. In the meantime, a team from the secretive US Navy Seal Team 6 unit, had been practising storming a mock up of the compound, constructed at US bases on both coasts. In the end, after months of investigation, the US had no conclusive proof of Bin Laden's presence in the compound. As President Obama told CBS television news, "this was still a 55/45 situation." Nevertheless, 2 May presented a moonless night on which to mount the raid. The president formally gave the go-ahead on the morning of Friday 29 April. But despite the detailed planning, the operation began to go wrong almost as soon as the raiders appeared overhead. Five aircraft flew two teams of Navy Seals from a US base in Jalalabad, Afghanistan, into Pakistan. Three large Chinook helicopters carrying a back-up team of 24 Seals put down near the Indus River, a 10-minute flight from the compound. The two other aircraft, specially adapted Black Hawk helicopters, flew on to Abbottabad. On board, were 23 Seals, a translator and a tracking dog called Cairo. Three of the Seals were specifically tasked to seek out Bin Laden. In the original plan, one of the helicopters was to hover over the main building allowing the Seals to clamber down ropes onto the roof. The other was to drop its team within the grounds of the compound. This should have taken just a couple of minutes allowing the aircraft to fly away, thereby attracting less attention. However, on arrival, the Black Hawk hovering over Bin Laden's building skittered around in the heat-thinned air forcing the pilot to ditch the craft into the ground. It made a hard landing inside the compound but its tail and rotor caught on one of the high walls. The other aircraft immediately landed outside the walls. Both teams clambered out unhurt but they had now lost the element of surprise and had to start blasting their way into the compound. Behind the perimeter walls were further inner walls cordoning off the three-storey main building where Bin Laden and his family lived and a smaller single-storey guard house. Leon Panetta, the CIA chief, has said the commandos blasted their way through "three or four" walls to get into the buildings. As the raid got under way, Panetta said, he and those in the White House situation room were in the dark for "around 20-25 minutes" as to what was actually going on in the compound. According to US officials, as the members of the US team moved to search the buildings they were fired on by one of the two brothers who were close confidantes of Bin Laden. Al-Kuwaiti is said to have fired from behind a door of the guard house. The Navy Seals killed him and his wife, who reportedly made a lunge for the soldiers. Moving into the main building the commandos come across al-Kuwaiti's brother on the ground floor. Believing that he was about to shoot, they shot him dead. On the way up the stairs, Bin Laden's adult son, Khalid Bin Laden, met the Navy Seal team. He too was shot and killed. On the top floor the trio of Seals looking for Bin Laden found him, some 20 minutes into the raid, standing at the end of the corridor. They recognised him immediately. He also saw them and ducked back inside a room. Initial US accounts of the mission said that before he was killed he had exchanged fire with the commandos while using his wife as a human shield. US officials have now told the Associated Press news agency that after the Seals rushed into the room, they found two women in front of Bin Laden, screaming and trying to protect him. One of the soldiers pushed the women aside, the Seal behind him fired at Bin Laden, hitting him in the head and chest killing him instantly. A later account from one of the Seals involved in the raid suggested that there was no fire fight with the US soldiers. According to this account, Bin Laden was killed as soon as he stuck his head out of his bedroom. He was still alive although badly injured when the Seal team entered the room where they shot him again killing him. After the shooting, one of the soldiers radioed his commanders: "Geronimo EKIA". In the cold military jargon, "EKIA" (Enemy killed in action) signalled that the team had killed their target. The message was relayed to the White House where President Obama is said to have received the news with a terse "We got him". 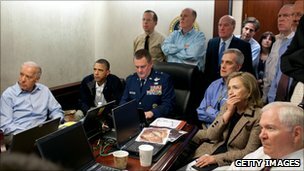 Those in the situation room did not see the moment of Bin Laden's death. Geronimo, it has been suggested was the code name for Bin Laden, but US officials have indicated that this referred to the stage in the operation in which Bin Laden was either captured or killed. As they began photographing his body, an AK-47 and a Russian-made Makarov pistol were discovered in the room, but Bin Laden had not touched them. Earlier reports suggested that Bin Laden's wife, believed to be 29-year-old Amal al-Ahmed Sadah, was in the room with him and was shot in the leg when she lunged at the soldiers. Pakistani police say that the couple's 12-year-old daughter was also in the room and witnessed Bin Laden's death. As the minutes ticked by, a suspicious Pakistani air force began scrambling some of its fighter jets, heightening fears in Washington that the US commandos could still be in danger as they tried to return to Afghanistan. Pakistan was not tipped off in advance about the raid although a Pakistani intelligence official told the BBC that once US helicopters entered Pakistan air space the US officials told their counterparts that an operation was under way against "a high value target". They were not told the target was Bin Laden. This ultimately led to the jets being called back. With Bin Laden dead, the US team prepared to leave. They trawled through the rest of the compound collecting a "treasure trove" of documents, computer hard drives, memory sticks and other material that could provide useful intelligence. One of the Chinooks flew in to collect the team from the broken helicopter. They loaded up Bin Laden's body, corralled those still alive into a room, piled explosives into the damaged aircraft and blew it up. They then left for the US air base in Bagram, Afghanistan. One neighbour in Abbottabad told the BBC how one of the departing helicopters swept past his house, "flying very low, coming very close". "I threw myself to the ground thinking it was going to collide with my house," Zahoor Abbasi said. From there Bin Laden's body was flown to the USS Carl Vinson, a US aircraft carrier in the north Arabian sea, where Bin Laden was prepared for burial. A White House spokesman said the corpse was prepared for burial "in conformance with Islamic precepts and practice", then placed in a weighted bag and dropped into the water from the vessel's deck. Officials said this was to prevent his grave from becoming a shrine.. The Pentagon's release of "home videos" of Osama Bin Laden show the US is now in control of the al-Qaeda leader's public image, the BBC's Natalia Antelava says. Bin Laden's place in history? Indian police make their first arrests in the case of an elderly nun who was raped in West Bengal, sparking outrage.